Releases from Wyangala Dam and Lake Brewster are changing, with some river levels and flow rates in the Lachlan river systems set to decrease, while users between Wyangala Dam and Cowra may experience an increased fluctuation of river levels of up to 0.3 m.
The reduction of overall flows from Lake Brewster and Wyangala Dam is a consequence of lower demand following completion of summer watering. “With conditions predicted to remain dry, WaterNSW is managing river operations to minimise losses within river systems and to ensure that future water availability is as high as possible,” WaterNSW Executive Manager Systems Operation, Adrian Langdon said. “Fluctuations to river levels between the Dam and Cowra will be due to a program of varied release rates dam designed to assist Cowra Shire in maintaining town waters supply. monitor pumping infrastructure, particularly water intakes and suction lines. orders to ensure that deliveries are received on time. It is unlikely that the annual stock and domestic replenishment flows would be delivered to the lower Lachlan effluent creeks in the autumn/winter as these systems were under flood conditions until mid-December to early January 2017. However, any surplus flows arising from tributaries downstream of the dam after filling the lakes may be used to top up the stock and domestic supplies in these systems. WaterNSW will continue to monitor water resources and weather conditions and adjust planned delivery patterns in response to changes in conditions as required. 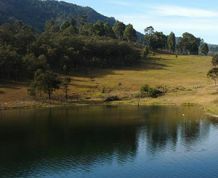 ・ Accessing www.waternsw.com.au and logging onto your IWAS account.